I am the will of our gods. Nemeton is an archetype people have been trying to build for a very long time. Over that time it has truly earned its name of “Meme-ton”. There’s been some recent activity around it, such as Son of Makuta’s recent attempt. I will argue that people have been trying to build Nemeton all wrong from the start. Relying on expensive cards with the power to generate lots of tokens is NOT the way to go. Throw out your Emblas, Pandoras, Khymeras, Dioltases. Leave your Jax Truesights in the midrange decks where they belong. The truth about Nemeton is that if you try to go slow, you WILL be outclassed. You will be burned down by aggro. You will be outvalued by Wanderer and Fault as they remove your token generators cleanly, one at a time. You might cast an Embla and then look at your Nemeton and wonder why it isn’t a Winter’s Wake. We want to complete the trial as fast as possible. By 6 mana, your trial should be complete; if it is not, you should be threatening to complete it, so that your opponent cannot find the space to drop Wanderer or Fault. We want to be fast consistently. To do this, we skew our curve towards the low end, with most of our token cards costing 2 mana, some costing 3, and only the best 4+ mana cards. This lets us use the mana tiles in the first few turns to spew out token cards with high velocity, typically placing down 2-3 token cards per turn. This puts our opponent under considerable pressure to draw specific answers to prevent us from completing trial. In practice, I am able to complete trial on turn 4 or 5 most games, with highrolls as early as turn 2 or 3. Why Kara? She makes our tokens significantly harder to kill, which is the best we can get out of a Vanar BBS. We don’t need Faie’s chip damage – when we win, we win big, and when we lose, dealing 8 damage wouldn’t have helped. Ilena is for the most part too slow and situational. Jaxi is a great card. He is removal resistant, making him a great turn 1 play, as you can expect his token to be available later. Gravity Well is an all star, locking down the opponent so they cannot clear our other tokens. Bonechill Barrier and Gravity Well both create multiple bodies which your opponent will struggle to clear in a timely fashion. They make perfect Aspect targets. Thicket Augur is surprisingly great. His first body is an Aspect target, and playing multiples can really gum up the board. Rescue RX is the worst of the 2 mana cards. His healing can sometimes be relevant, but the fact that he leaves token form after 2 turns means that you really want to save him until the turn you complete trial. We still run him for consistency, as a bad 2 mana token is miles better than a good 3 mana token, as the extra mana can be the difference between completing trial or not. Circulus is an interesting case. It takes more setup than the other 2 mana token cards, and is really a 3-4 mana token. You often won’t have time for his setup, which is why he is a 1 of. However, the ability to hold a 1 mana token in hand is strong, and he has a high value ceiling. You could easily run 2 Circulus. Aspect of the Bear and Aspect of the Fox are going to be your bread and butter. Use them on non-tokens, and try to get some tempo by taking out your opponents minions in the process. They also serve as interaction/removal later on. Drake Dowager, Moonlight Basilisk. I am a big fan of a 2-1 split on sentinels these days, to keep your opponent guessing, although 3 Dowager might be correct. The sentinels are objectively the strongest of the 3 mana token cards. 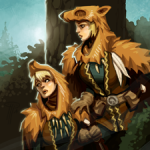 Dowager will often prevent your opponent from attacking with his general, which means your other tokens live longer. If he flips, then he makes a drake and you still get a token. Blazing Spines is my other 3 drop of choice. They can be used to control space, but typically don’t do much. The good part is that they are unlikely to be cleared. The second spine can be used as an Aspect target in a pinch. They are included as the best 3 mana option which immediately creates a unique token. Wintertide is the best 4 drop we could ask for. 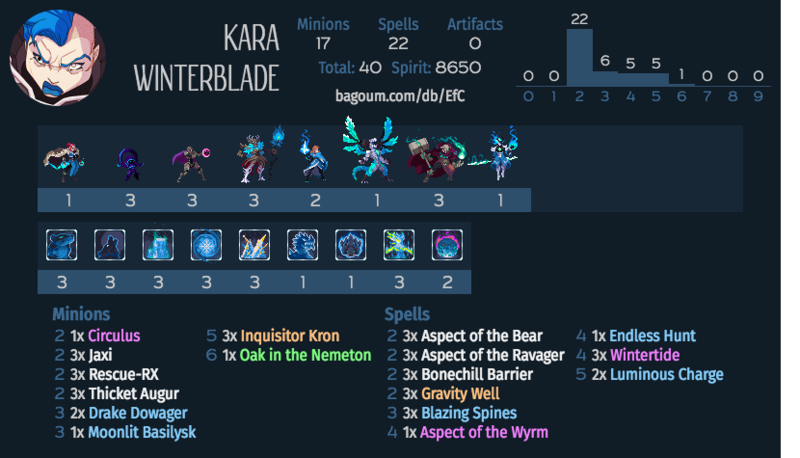 Multiple tokens make it hard to clear, and it plays well with Kara BBS. Huge pressure after Nemeton. Endless Hunt is a great one of. Its token is unique, and it can be used as a win condition if your opponent draws out the game after you drop Nemeton. Aspect of the Drake is another unique token, and can be used to fly in you our of position tokens post-Nemeton. Originally I had a spread of many different 5 mana cards, to make sure we had unique tokens. However, Kron usually gives unique tokens, and is the best 5 drop we can ask for. He protects our tokens with provoke, and will create a second unique token if left unanswered. He’s the slowest card in the deck, but is necessary to make sure we win after Nemeton comes down. Charge is the other 5 drop of choice, and is too good not to run 2 of. It creates 5 tokens which is a huge number. Your opponent will be hard pressed to clear them all, and you will be left with multiple Aspect targets. It can sometimes also act as a win condition with Kara BBS. I won’t say this deck is amazing. But it can steal a surprising number of games. If your opponent doesn’t have a way to clear many tokens, you WILL complete the trial on turn 2 or 3. Then you can drop Nemeton on curve. The opponent will be very hard pressed to answer a resolved Nemeton. Of course, you will have to take my word for it. Trying to use slow cards like Embla and Dioltas, you have probably never resolved a Nemeton. But go forth, young Duelyst, armed with this knowledge. Experience for yourself the bliss that is getting lethal on 6 mana by playing an on curve Nemeton.